Able Moving & Storage encourages all customers considering storage to visit the facility. A guided tour and explanation of the storage process will provide you with peace of mind, and allows us to show you our clean,neat, and well organized facility and introduce you to our wonderful staff. Able Moving & Storage owns and operates 4 large warehouses. The warehouses were built specifically for storing household goods, office furniture, and equipment. Goods are stored in wooden storage vaults or on steel racking. Proper padding and shrink wrapping are applied to all of your goods as appropriate, and the goods are then placed in vaults or on racks. Able Moving’s secure facilities are fully protected by secure fencing, monitored by 24-hour video surveillance. Our secure, state-of-the-art warehouses feature the very latest in fire and theft protection as well as trained, full-time staff. I honestly could not have asked for a better experience. Everything went extremely well, and even finished ahead of schedule. Nash was great to work with, and a real professional. The entire Able Moving staff that was on site last week had a great attitude, were helpful, and easy to work with. I’m really looking forward to working with you all again tomorrow and Saturday – see you then! Chris just wanted to thank you for the crew you provided last night. I am most impressed by the fact that EVERY MAN on the job last night had the how can I help attitude. This is the quality that separates one moving company from another. If the pricing is fair, competitive and staffing has this attitude, you will never have to look for jobs…they will find you. There are not enough stars that show my appreciation for their safe and quick move. Had 2 short distance moves in January 2014 and in March 2017. EXCELLENT times 2. We can't say enough good things about Able Moving & Storage. We interviewed 5 local movers before selecting Able to move us from NOVA to SC and we are very happy with our choice. They were very professional, efficient and on time. Both the loading and the delivery went without incident, nothing lost, broken nor damaged! We appreciated the same crew packed and delivered us. The only incident was that the key to my grandfather clock was inadvertently left in NOVA, but when the crew chief realized this he called his wife to overnight the key to us. He even had his wife take a picture of the package. As promised, the key arrived without delay. He could have easily said the key was lost, but went over and above to meet our expectations! We highly recommend Able Moving for your out-of-state move! We have moved many, many times over the years, but our most recent move facilitated by Able Moving & Storage was definitely our best. The team that we had to pack us out last Wednesday was definitely hard-working, efficient, knowledgeable, careful with our household goods and so polite - a definite A TEAM!!!!! The team consisted of Devon, Ronnell, Diogenes, Rush & Jeff. Needless to say, we were beyond pleased with the job done and would highly recommend them to anyone and everyone. Shawn, the moving consultant, and Stephanie, the moving coordinator, were also great. From start to finish, this was a JOB WELL DONE!!!!! Able is the best!!!!!!! Professional, careful and exceptional customer service. We were confused on a moving company but my instincts told me to call ABLE Moving and talk to someone to see how it goes. Well it was amazing especially with the guidance of Stephanie Mastbrook, she made the entire process easy to understand and professional. We were only doing a small local move but the professionalism never lessened either by Stephanie or Jose (Lead of moving crew); everything was handled with perfection. We will be using ABLE again and recommending the company to friends and family in the future based on our experience. Thank you! I was referred to Able Moving by a relative and I'm very glad I trusted them with my move. I didn't move far - only about 5 minutes down the road, but both the apartment I moved out of and the condo I moved in to involved long carries and multiple stairs. The movers were efficient, but careful with all of my furniture. I have a lot of big pieces of furniture, and they safely deposited everything with no damages. I hate the hassle of moving, but Able Moving definitely made the experience a great one. Hi Nick. Thanks for your message. The move went very, very well. The three women who packed up our household in DC on January 9 did an excellent job (working long hours since we have so much small stuff). They really, really knew what they were doing -- everything came through in great shape. The second day the team working on loading the truck did a really good job, too. Stephanie at your office was very patient with me when I had questions and always got back to me promptly to explain procedures and what we should expect. The team that drove our things to Sarasota was also first notch. They were very careful working in our brand-new house, making sure not to leave so much as a scratch. They were very energetic and worked really hard since they were just 2 guys with lots to unload as well as some stuff to assemble. Frankly, as a former manager, I was particularly impressed with Able's team leaders. They seemed to have excellent working relationships with their colleagues and were truly able to encourage their people to get things done and get them done well and quickly, too. So I would say Able did an excellent job all around. Able Moving and Storage provides great customer and delivery service. When we wanted to have our furnishings delivered days before the Christmas holiday, they made the necessary arrangemets to meet the requested day and time. The two crews sent were professional, efficient, polite, and worked well together. I highly recommend this company for any move. Mr. Jones, I just wanted to take time to inform you of the excellent work done by Rush. Rush moved my daughter's (Dawn Moncrief) furniture from Washington D.C. to Orlando FL on March 25th. My husband (Hal) and I were present for the delivery. Rush impressed both of us with his professionalism, hard work and skill as he moved the furniture from the truck into the house. Rush was as pleasant as he was professional. Hal and I really enjoyed meeting Rush and will definitely recommend Able Moving and Storage to anyone thinking about moving. We needed moving and storage. From the beginning Able accommodated us in every way. Our estimator Shawn was very helpful as we had not used a moving company before, he provided lots of information. The moving crew, Luis, Belkis, Dio, Steve and Dominique were very good at their job, friendly and just a great group to work with. Our furniture arrived safely and they placed it as we requested. They took their time to make sure everything was as we wanted it. I highly recommend this company. Our relatively small nonprofit utilized ABLE for our recent office move and could not be happier. Everything from the planning stages to completion was done with excellence by courteous, enthusiastic, and diligent professionals. This is not to say there were no hiccups along the way; however, ABLE stood behind their work and went above and beyond to resolve every issue we had which involved making corrections a filing system we had relocated, to making minor hardware repair on a furniture piece, and a repainting a scuff in the hallway wall that our former landlord called out. We even utilized them to hang all the international photography in our new office and they exhibited extreme patience while this project had to be tweaked on the fly and lasted a good deal longer, making every change we requested of them without complaint. This is an organization that clearly goes the extra mile and while giving you confidence that they will stand by their work. We highly recommend them for your office move. Once again Able has done a fantastic job! They moved me into my last house 4 years ago and just moved me again today. The crew was fast, efficient and on time. I had a beast sofa and honestly didn't think it would make it in the new place, no problem for the crew. If moving, Able is hands down the best of the best. 6 stars. My husband and I just moved within our home town and called upon ABLE Moving because our employers use this company. We were very satisfied with the professionalism, speed and thoughtfulness of the team of 3 sent to support us. When one large piece of furniture proved especially difficult, they problem solved together and successfully moved the epic piece into our bedroom as requested. They were polite in all of their requests and questions (such as where an unlabeled box should go or how might they best support us today). My husband and I would highly recommend this company to any friend or family member needing professional moving support. Absolutely fantastic experience! The morning crew and afternoon crew…outstanding, customer service driven and greeted us with a smile! I just wanted to take the time to tell you how wonderful the two gentlemen from your team were! They were extremely helpful and I look forward to working with them again. Thanks for your help on all this! I would highly recommend Able Moving & Storage to anyone. The movers and staff were very professional. We had to execute a commercial move in less than 3 weeks. They arrived on time (even early), packed and loaded our trucks and quickly and securely made the delivery with no issues. This team of professionals were prepared for every complication that arose in this short-timed move and provided instant work arounds for everything. I've never had a move executed with this accuracy and attention to detail. I'd refer them to any of my friends and we'll definitely use them again. My wife and I used Able Movers for their full pack and moving services. We could not be happier with our experience. Luis and his Crew, Belkis, Reymond, and Steve were extremely friendly and professional. The level of care they took delivering our belongings was exceptional. I highly recommend them to anyone looking for a great crew of movers. I couldn't ask for a better moving experience. Able was courteous, prompt, professional & helpful. I highly recommend them. The Able Moving & Storage Team went above and beyond again for my 2nd move with them. They team arrive right on time, moved quickly and carefully, and were a pleasure to be around for the entire day. The crew spoke highly of the company and expressed how much they have enjoyed working for Able. The career satisfaction was evident in their quest to provide outstanding customer service. Thank you again Able for making a not so exciting process stress free and enjoyable. My wife and I were pricing movers and Able was the second company we contacted. From the beginning, Nick left us the impression that dealing with Able was going to be a different experience. He went through the house, outlined their procedures, did his measurements and had a quote for us in less than half an hour. They were able to store our possessions without any problem and a week later, the delivery was handled very quickly and professionally by the same team that loaded it. Call them before you price any other companies. I could not have been more pleased with our move. Abel Moving and Storage is fantastic! I had to change our move date twice and our move coordinator was most gracious in accommodating us each time. She was always happy to answer any questions I had and helped to make the entire process run smoothly. The packing team did a great job -not one thing was missing or broken. They arrived on time and were very professional, efficient and courteous. Ditto for the moving crew. They were very careful to make sure they didn't ding up walls, etc. and were very professional and courteous. If we ever move again I will definitely use them and highly recommend them to anyone. Kudos for a job well done! Good morning, Bob... just a quick note to say "thank you" for sending Rush as our move coordinator/packer - he was fantastic! Very professional and personable - he was a delight to work with! And - my mother loved him (which, ultimately, is most important)! Carlos and his co-worker from Able Moving have finished reconfiguring the 2 front work stations in the Call Center. They had to go to the Control Center to get additional parts. They did a beautiful job. Timur was able to assist us on short notice and get the IT and phones disconnected and reconnected. Thanks, Timur! The job turned out very nicely if I do say so myself. Thanks Mike and Chris for getting this together. And especially, Chris, if you would, thank your 2 guys for us. They did a great job. Just wanted to thank all of you for your help coordinating the move yesterday, which so far as I can tell went off seamlessly. Dorian and James, the two guys from Able who moved the items, were great. I definitely recommend Able Moving for future projects and I will call them first the next time I have a similar project. Able Moving prefers to containerize all shipments at the residence to minimize handling and damage. 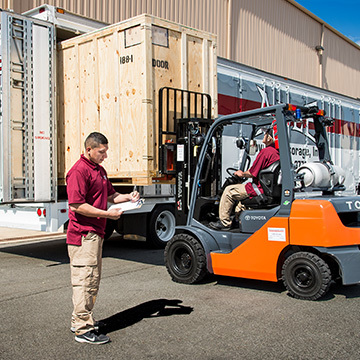 Properly done, your goods are loaded into storage vaults brought to your residence and delivered the same way. This process requires only 1 load and 1 unload of your household goods, as opposed to “loose loading” into trucks and unloading at the warehouse. Your items are protected before they are loaded, and remain protected until delivered.